The mission of the U.S. Green Building Council (USGBC) is to transform the way buildings and communities are built and operated, enabling an environmentally and socially responsible, healthy, and prosperous environment that improves the quality of life. USGBC’s vision is that buildings and communities will regenerate and sustain the health and vitality of all life within a generation. The purpose of AGU is to promote discovery in Earth and space sciences for the benefit of humanity. AGU’s vision is to galvanize a community of Earth and space scientists that collaboratively advances and communicates science and its power to ensure a sustainable future. To this end, AGU and USGBC’s sustainability goals align as both aim to ensure a sustainable future through their respective organization’s efforts. USGBC has evolved the LEED (Leadership in Energy and Environmental Design) rating system to address these challenges and provide solutions for the building industry. Many environmental impacts are associated with buildings and addressed by rating systems like LEED, but climate change requires special consideration because buildings and land use are responsible for a large proportion of greenhouse gas emissions. The building industry alone is responsible for 39% of CO2 emissions in the United States per year.4 High-performing green buildings, particularly LEED-certified buildings, play a key role in reducing the negative climate impacts of the built environment. Every day, AGU members analyze the temperature fluctuations on the moon, predict volcanic activity in Hawaii, simulate snowflake melting patterns in 3D animations, measure the rate of glacier retreat in the arctic, explore the temperature limits of life in the deepest parts of the world’s oceans, and study the impacts that oyster reefs have on water quality. Though AGU members are stationed around the world, the Washington, DC, headquarters provide members and staff alike a place to meet, learn, and share new ideas in order to advance the mission, vision, and values of the organization. AGU has been based in Washington, DC, since it was formed in 1919, and remained at their current Dupont Circle location for almost 40 years. In 1979, the organization purchased the Dupont Circle site, which included a smaller office building, but by the 1990s determined that a newer, larger building was needed. Construction on the existing building structure was finished in 1994. By 2013, AGU determined that it was time to renovate the existing office space as the building and infrastructure were reaching the end of their useful lives. The team chose to renovate rather than demolish the building and rebuild to reduce their environmental impact. In addition to maintaining as much of the exterior as possible, the building shell maintains the historic character of the neighborhood. When it became clear that the existing 62,000 sq. ft. building required a major renovation, AGU decided to take their vision to the next level. “A building is a physical structure, but there is no reason why a building as a physical structure can’t embody the vision of an organization,” explains AGU CEO and Executive Director Christine McEntee.5 The new office space design reflects AGU’s mission of “science for the benefit of humanity,” showcasing their members’ work and values, promoting sustainable technologies and strategies that are brought together in a way that has not yet been seen before while educating the public about the positive impact science can have on society. In what might have been a routine project, AGU used the opportunity to transform headquarters into a living representation of the organization’s mission, science, and purpose. From the start, AGU committed to sustainability and reducing the organization’s environmental footprint. Seeing the value in the latest innovative green building strategies, AGU explored the possibility of a net zero energy building. When the existing building was completed in 1994, the green building movement had just begun. USGBC was founded a year prior, in 1993, and the LEED rating system had not yet been created. In the 25 years since the USGBC was founded, the green building market experienced tremendous growth and LEED has become the world’s leading green building rating system. The headquarters renovation aimed to show what was possible in green building through a variety of sustainability strategies, including LEED. In the process, the renovation has not only met but exceeded green building expectations and even surpassed LEED credit thresholds. The AGU renovation is a true example of what can be accomplished when projects view LEED credit requirements as a guideline and use certification to push beyond what is simply required. The project is registered to certify under LEED v2009 standards and is striving to achieve the best possible results in each of the LEED categories available, on track for a Platinum certification. As of August 2018, the project is on track to earn 96 out of 100 points and will be among the highest scoring LEED projects in Washington, DC. The AGU project evolved into 4 major strategies that created synergistic effects aligned with LEED practices and, ultimately, LEED credits. This was the result of strategies and synergies that demonstrate the best elements of LEED efforts, regardless of the version. In fact, LEED was not an end goal of the project, but was used to: explore best practices; provide a framework to communicate ideas, requirements, and standards with project partners and suppliers; and leverage the DC permitting process. The AGU project registered for LEED v2009, since this version was deemed more appropriate for the timeline of the project. However, the project team recognized that they could go above and beyond by incorporating certain strategies from LEED v4 to achieve the best available in green building standards. The LEED v4 rating system, introduced in 2014, evolved alongside the green building movement and accounts for the successes and challenges that come alongside the transformation of the green building market. The LEED v4 rating system emphasizes “closing the loop” on the entire building process. A closed system is a cyclical system rooted in science where materials and resources are consumed and then reused, recycled, or returned to the environment in a way that is restorative rather than damaging. Closed loop systems mimic natural systems, the same natural systems that AGU members interact with in their everyday work. Closed systems are considered sustainable because waste is reduced. Today, society functions primarily in open systems, where materials and resources are consumed and then removed as waste and discarded. The cradle-to-cradle concept aims to create closed systems, eliminating waste by reusing resources. LEED v4 was developed on the principle of closing the loop in the built environment, and the AGU project builds off this principle to operate in a sustainable ecosystem. 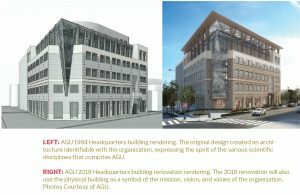 In each of the sustainability strategies, there is a common thread that relies on creating closed systems to make the AGU office a regenerative building. From the reuse and recycling of old building materials to the innovative municipal sewer heat exchange, the project pushes the boundaries of what is possible in the evolution of green building. Though the project implemented LEED v4 strategies, the project does not always earn LEED credit points for going above and beyond the v2009 requirements. AGU pursued LEED v4 strategies because these principles were important for the success of the project and aligned with AGU’s mission, vision, and values. From the outset, AGU established open channels of communication between all stakeholders. The intent of the Integrative Process is to support high-performance, cost-effective outcomes through an early analysis of the interrelationships among systems. This is achieved in the pre-design and throughout the design phases, identifying and using opportunities that achieve synergies across disciplines.8 Though the Integrative Process is not a requirement for LEED v2009, AGU went beyond what was required as it is part of their mission. Involving all stakeholders as early as possible helped the team identify potential roadblocks and collaborate on strategies that would ultimately meet the project goals. The process ensures early buy-in from stakeholders, including the community and local government. AGU held meetings with members, staff, and other stakeholders, including the contractor and construction manager, as well as the commissioning authority and energy modeler who are often not included until later in a project. Additionally, AGU involved city authorities early in the process, maintaining contact and ensuring open dialogue as the project moved forward. Municipal involvement was integral as the project identified challenges with the city water system. It also allowed the team to work out logistics and requirements, which included merging technology with a 100+ year old sewer. Incorporating an integrative process saves times, saves money, leads to a higher performing building, and helps incorporate all of the organization’s goals from the beginning of a project. At the design phase review alone, in the early stages of the project, the AGU office has already earned 67 points, enough for a LEED Gold certification. After assembling the right team and developing project goals, most significantly striving for net zero, the integrative team explored options—56 options to be exact. Ultimately these options turned into white papers that emerged into 4 major strategies for the project: Reduction, Reclamation, Absorption, and Generation. This process showcases the importance of studying specific conditions to meet requirements, and highlights the paradox of sustainability and rating systems, where often one beneficial aspect of design limits implementation of another. Geography and climate often define approaches to efficiencies. During the exploration phase, the urban nature of the project limited mainstream geothermal options. As the team researched other options, municipal heat exchange became a real possibility because the DC sewer line runs right in front of the building. Another unique opportunity was found in the south side of the building flanked by a neighboring structure. Limited daylighting options opened up opportunities for solar photovoltaics (PV) as the generation source, an almost unheard of approach for a 7-story structure. Those unfamiliar with sustainable strategies may incorrectly think that there is a one size fits all way to earn “points,” but sustainability is much more nuanced. As one sustainability door closes, creativity can open new ones. The AGU project relied on a suite of technologies that were developed from the 4 major strategies guiding the project. This approach ensured that a range of options was explored, which included a trip to Europe to see first-hand how green building technologies are implemented abroad and how these technologies can be incorporated in projects in the United States. As is true with any green building project, there was no one-size-fits-all solution for the AGU headquarters renovation. AGU is incorporating a suite of innovative strategies to achieve their goal of net zero energy, and is currently on track to earn all LEED v2009 Energy & Atmosphere points. AGU sees climate change as a real issue facing our planet. The renovation project also provided the opportunity to lead by example as a model for sustainable design. Net zero energy means that the total amount of energy used yearly by a building is equal to or less than the amount of energy created on-site through the use of innovative technologies and renewable power generation. 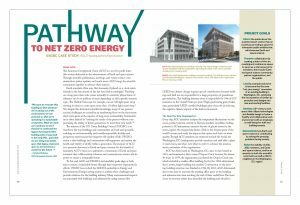 Net zero energy is an unprecedented sustainability goal for the urban office retrofit, typically reserved for new construction projects. The Energy Use Intensity (EUI) indicator is used to measure a building’s total energy use. To go from AGU’s 1994 building EUI of 90 to an EUI of 0 or less (indicating net zero energy use), the team needed to incorporate aggressive and innovative strategies. LEED approaches energy for a holistic perspective: energy use reduction, energy-efficient design strategies, and renewable energy sources. To start, AGU looked for ways to reduce the overall initial energy demand with a high-performing building envelope, use of natural daylighting, and installed low-e, low reflective glass windows that reflect heat and help keep the interior cool. Energy efficient building control systems, improved insulation, and low LED lighting were installed to help reduce energy needs. In addition, workstations are designed with limited loads, with average users sized for laptops and monitors. To meet this requirement, AGU had to work through technological challenges, including the challenges using Direct Current power and the selection of laptops. Of course, some job functions require additional plugs and the organization will work together to right-size load requirements. LEED v4 Materials and Resources credit category focuses on minimizing the embodied energy and other impacts associated with the extraction, processing, transport, maintenance, and disposal of building materials. The latest v4 requirements are designed to support a life-cycle approach to improve performance and promote resource efficiency. AGU built off the underlying intent of the LEED v4 Materials and Resources credit category to improve their materials footprint throughout the project. Whole building life cycle assessment (LCA), a quantitative analysis of the environmental impact of a building, is not a requirement in LEED v2009, though it can be included for points for pilot credits or an innovation credit. Added to the LEED v4 rating system, the intent of the LCA is to optimize the environmental performance of the building’s products and materials. Conducting an LCA early in the project, design, and construction decisions can be made to further improve building performance. Commonly reported metrics include global warming, acidification, photochemical oxidant creation, and ozone depletion. The LCA generates a baseline and a proposed building scenario, where the service life of the baseline and proposed buildings must be the same and at least 60 years to fully account for maintenance and replacement. Though it was not a requirement, AGU chose to pursue the LCA to ensure that their space was maximizing its sustainability efforts. The whole building analysis allowed AGU to reflect on the progress toward their goals, compare their performance to other buildings, and identify areas for improvement. Only a handful of projects conduct a whole building LCA, as it may seem like a daunting undertaking. The LCA provided a quantified way to understand the impact of sustainable materials, best exemplified by the discovery of an alternative carpeting choice that reduced impact by 80% compared to standard carpet. LEED v4 Building Product and Disclosure credits were not included in the AGU project. However, these concepts were considered as part of the integrated design approach and the overall sustainability goals of the project, especially to address the human health impacts of the building. During the LCA analysis, the team found many products with Environmental Product Declarations (EPDs). The EPDs and other product certifications align with the LCA because they typically have lower impacts than standard product counterparts. Though the LEED v4 Building Product Disclosure and Optimization credits were not pursued, many of the products specified align with the intent of the credits and the spirit of the requirement. Aiming to maximize LEED thresholds for Construction and Demolition Waste (75%) and for Building Reuse (75%), the project reused anything and everything possible. Organizing early on in the process to reuse all materials possible, the team carefully identified items for reuse, first internally, then through donation and finally recycling any items that could not be reused or donated. Of course, the biggest reuse of all can be seen in the use of the existing building structure, ranging from the obvious concrete foundation to often forgotten items like piping, furniture and even bricks. Tables, chairs, and cabinets were repurposed and recycled for other uses. 191 chairs will be upcycled for use in the conference areas. Over 50 doors remain on site for reuse. An estimated 5,000 pieces of brick were carefully removed from the old building and integrated into the new building. Paneling will get a second life in new wall designs and as screens in the restrooms. Even fire extinguishers, AED metal cabinets, and “EXIT” signs will be reused rather than purchased new. The distinctive AGU granite compass on the lobby floor remains to greet members and visitors. Perhaps the most innovative reuse story of the AGU renovation project can be found in the terrazzo material, which is comprised of granite, non-compliant toilets, sinks, and glass ground up and mixed into material that will remain in the building for the coming decades. The recycled terrazzo is found on the ground floor lobby, the elevators, and on the tabletop of the executive conference room. Some items originally flagged and set aside for reuse could not be used in the new space due to incompatibility with other goals. For example, some items like halogen lights did not meet energy requirements and were donated. Ultimately, AGU donated more than 200 items, including furniture, appliances, building materials, office supplies, and even weight lifting sets found new life with other organizations. DC Public Schools was the largest recipient, with a total of 124 items. In addition to furniture and appliances, DC children will use bike racks from the pre-construction AGU site as well as maps and science-themed artwork. As evidenced in the project goals and the resulting sustainability strategies, AGU is doing everything possible to create an innovative space that reflects their mission, vision, and values. However, much like any green building project, the project faced challenges out of their control, which limited some strategies along the way. While the design team wanted to achieve net zero water requirements, Washington, DC, regulations do not currently support these efforts. The building will collect rainwater from the roof to reduce water and sewer utility bills and will filter and condition water, producing all the water needed for toilets and on-site irrigation and earning all LEED v2009 Water Efficiency points. Municipalities and regions can help make net zero water a reality by re-examining policies, incentives, and other paths that promulgate this crucial environmental initiative. AGU explored the possibility of storing excess energy generated to go beyond net zero into net positive energy. However, the space needed to store the required batteries and equipment was not available at the building location. The AGU project team fully embraced their project goals to raise the visibility of AGU and to inform the public about Earth and space sciences throughout the project. The project fully embraced and embodied this core objective for education and outreach, enlisting a renowned communications firm to assist in developing consistent, clear messaging throughout the process. 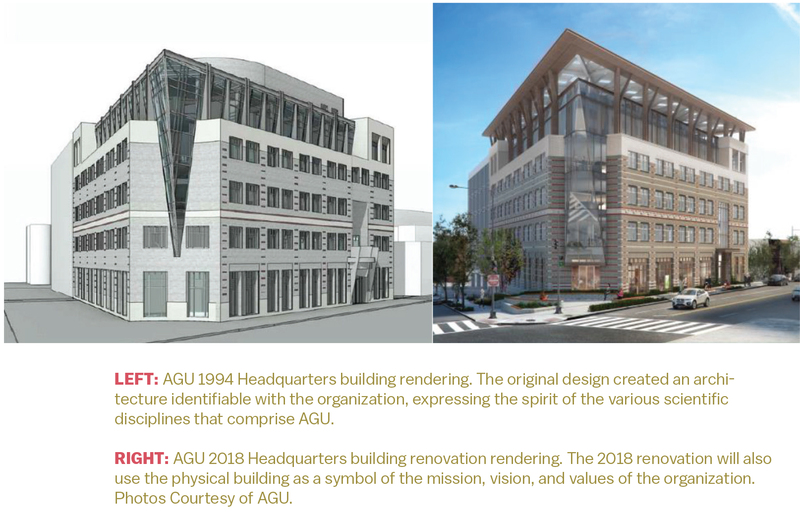 Since November 2015, AGU has shared the entire headquarters renovation process in the Building AGU Blog at https://building.agu.org/category/project-update. This level of communication from a project team is not typical on a LEED project, but once again shows AGU’s commitment to being a leader. The building project blog includes construction updates, photos of the process and progress, and details the various sustainability strategies discussed throughout the case study. AGU has also offered tours to different groups during the process to see the construction site and see first-hand about the suite of sustainability strategies being implemented. AGU will move back into the renovated office and finalize their LEED Platinum certification. AGU will be working towards making their building data available online and in the building’s lobby for those interested in green building performance and sustainable technologies. Tours of the space will be open to the public. Follow the AGU Project Blog to stay informed of the progress and the performance of Washington, DC’s first net-zero energy commercial renovation. This report was prepared by the U.S. Green Building Council (USGBC) (www.usgbc.org). USGBC is committed to a prosperous and sustainable future through cost-efficient and energy-saving green buildings. USGBC works toward its mission of market transformation through its LEED green building program, robust educational offerings, an international network of local community leaders, the annual Greenbuild International Conference & Expo, the Center for Green Schools, and advocacy in support of public policy that encourages and enables green buildings and communities. Reprinted with permission from USGBC. More information on this case study and a corresponding course can be found at https://tinyurl.com/ycy5eooh.